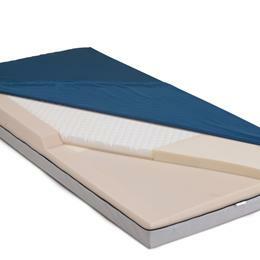 Medline Advantage "Select" Ve Mattress: Our High Resiliency Foam Top Layer Provides Excellent Pressure Redistribution And Uncompromised Comfort. The Sculpted Design Uses Cropped Foam To Provide Air Channels To Keep Patients Cool And Comfortable. Anatomically Designed Mattress Core Allows The Body To Sink Into The Mattress Redistributing Pressure Away From The Bony Prominences Reducing The Risk Of Skin Breakdown. Heel Section Features Visco Elastic Memory Foam That Cradles The Heels Allowing For The Ultimate In Shear Reduction And Pressure Redistribution. Nylex Top Fabric Combines Durability, Performance And Reduces Shear. Fluid Proof And Antimicrobial. Meets Federal Fire Standard 16 Cfr 1633. 350 Pound Weight Capacity. 6 Year Warranty. 36" X 76" X 6".